“Eric Holder Jr., the nation's first black U.S. attorney general, is preparing to announce his resignation Thursday after a tumultuous tenure marked by civil rights advances, national security threats, reforms to the criminal justice system and five and a half years of fights with Republicans in Congress,” National Public Radio added. Holder was voted on a bipartisan basis into both criminal and civil contempt of Congress for his failure to comply with a congressional investigation into the gun walking program Operation Fast and Furious, run by the Bureau of Alcohol, Tobacco, Firearms and Explosives (ATF) with oversight from senior Department of Justice (DOJ) officials. A total of 130 members of the House of Representatives called for him to resign in 2011 and 2012, as did eight U.S. Senators and every GOP presidential candidate in 2012, including the eventual presidential nominee Mitt Romney and vice presidential nominee Paul Ryan. As the House Oversight Committee voted to hold Holder in contempt on both the criminal and civil citations, President Barack Obama asserted executive privilege over the Fast and Furious documents that Holder refused to provide to Congress pursuant to subpoenas from chairman Rep. Darrell Issa (R-CA). The U.S. Attorney for the District of Columbia, Ron Machen, declined to prosecute Holder on the criminal contempt of Congress citation, but the House of Representatives is currently pursuing ongoing legal action against the administration using the civil contempt citation to fight to have the president’s executive privilege overturned. Sen. Chuck Grassley (R-IA) and Issa have both argued the president’s privilege assertion over those Fast and Furious documents is invalid and illegal because he used the lower form of the two types of executive privilege—deliberative process privilege—rather than presidential communications privilege. If Obama used the higher form, it would have meant that either he or his senior White House staff was aware of the gun walking tactics employed in Operation Fast and Furious, something that both Obama and Holder have denied. Usually, deliberative process privilege claims are considered invalid when there is even a suspicion of government wrongdoing—something Issa and Grassley have noted time and again—and in this case the government has admitted to wrongdoing. Nonetheless, President Obama continues to hide these documents from the American people and from Congress. Holder accused this reporter in November 2011 at a White House press conference of being “behind” the calls for his resignation because this reporter had contacted various members of Congress, asking if they agreed with the surging calls for him to resign. "You guys need to — you need to stop this. It’s not an organic thing that’s just happening. You guys are behind it,” Holder said of this reporter’s efforts while working for The Daily Caller. Calls for Holder’s resignation have continued since 2011 for reasons other than Operation Fast and Furious. Holder’s press team also coordinated against various media outlets using far left-wing advocacy groups like the George Soros-funded Media Matters for America (MMFA). MMFA, which is led by pro-Hillary Clinton activist David Brock, used talking points and direction provided by then-Holder spokeswoman Tracy Schmaler to smear this reporter, Issa, Breitbart News reporters, ex-DOJ officials and whistleblowers, and reporters from across the media. Emails recently uncovered via a Freedom of Information Act (FOIA) request by The Daily Caller found that Holder's press aide Schmaler specifically singled out and targeted this reporter. 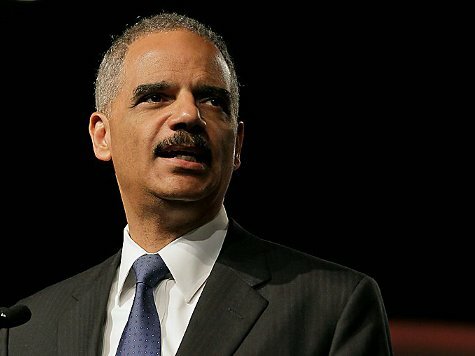 “As revealed in the FOIA docs, Media Matters Deputy Research Director Matt Gertz sent a post concerning the NRA’s growing contributions to Holder’s critics to DOJ spokeswoman Tracy Schmaler, Holder’s top press flack who resigned in March, 2013,” the Daily Caller’s Betsy Rothstein wrote. “Yeah, that was what my original piece on the story was about,” Gertz replied. The terminology that was provided to Media Matters by the Department of Justice about this reporter—the word “campaign” specifically—appeared in subsequent Media Matters posts about this reporter. The efforts to silence reporting on Fast and Furious are not the only questionable activity Holder and his team have been involved in with regards to the media. The DOJ labeled Fox News’ James Rosen a “co-conspirator” in an effort used to monitor him and targeted the Associated Press by monitoring the news agency’s communications. Holder has been a lightning rod for scandal since he was confirmed in 2009. Right off the bat, he declined to prosecute the New Black Panther Party (NBPP) for voter intimidation at voting stations in 2008 in Philadelphia, despite efforts by career prosecutors at the DOJ to do so. He has been involved in the Trayvon Martin case in Florida in 2012, the Michael Brown case in Missouri this year, and in allegations by whistleblowers that Holder stopped the prosecution of alleged financial criminals, politicians, and DOJ officials who are accused of having taken bribes in connection with a U.S. Virgin Islands telecom cooperative. Just like how the DOJ originally denied guns were walked in Fast and Furious and has since retracted that denial, the DOJ denied the Virgin Islands scandal’s early report. WASHINGTON — The Obama administration is secretly carrying out a domestic surveillance program under which it is collecting business communications records involving Americans under a hotly debated section of the Patriot Act, according to a highly classified court order disclosed on Wednesday night. WASHINGTON (AP) — The Obama administration on Thursday defended the National Security Agency's need to collect telephone records of U.S. citizens, calling such information "a critical tool in protecting the nation from terrorist threats." While defending the practice, a senior administration official did not confirm a newspaper report that the NSA has been collecting the telephone records of millions of U.S. customers of Verizon under a top secret court order. The order was granted by the secret Foreign Intelligence Surveillance Court on April 25 and is good until July 19, Britain's Guardian newspaper reported Wednesday. The order requires Verizon, one of the nation's largest telecommunications companies, on an "ongoing, daily basis" to give the NSA information on all telephone calls in its systems, both within the U.S. and between the U.S. and other countries. The Associated Press could not authenticate the order because documents from the court are classified. The administration official spoke on condition of anonymity because the official was not authorized to publicly discuss classified matters. Verizon spokesman Ed McFadden said Wednesday the company had no comment. The NSA had no immediate comment. Verizon Communications Inc. listed 121 million customers in its first-quarter earnings report this April — 98.9 million wireless customers, 11.7 million residential phone lines and about 10 million commercial lines. The court order didn't specify which type of phone customers' records were being tracked. NEW YORK – Using the Patriot Act, the U.S. government has been secretly tracking the calls of every Verizon Business Network Services customer – whom they talked to, from where, and for how long – for the past 41 days, according to a report published by The Guardian. The program was put in place under the Patriot Act’s Section 215, a controversial provision that authorizes the government to seek secret court orders for the production of “any tangible thing” relevant to a foreign-intelligence or terrorism investigation. Recipients of Section 215 orders, such as telecommunications companies, are prohibited from disclosing that they gave the government their customers’ records. In May 2011, shortly before Section 215 was scheduled to expire, the ACLU filed a new FOIA request in an effort to learn more about the “secret interpretation” to which Sens. Wyden and Udall had referred. Congress reauthorized Section 215 without amendment until 2015, and for the last two years, the government has refused to describe its secret interpretation. Whether or not the program described by The Guardian reflects that “secret interpretation,” today’s disclosure confirms that the government has interpreted Section 215 extraordinarily broadly. This disclosure is likely to have significant implications for the ACLU’s pending FOIA lawsuit. The Department of Justice is scheduled to file a brief in that case on June 13; the ACLU’s response is due on June 28, and oral argument is scheduled for July 11 in the Southern District of New York. Attorney General Eric Holder: "I respect the oversight role that Congress plays. This isn't always a pleasant experience; it's one that I recognize that you go through as an executive branch officer. The one thing I've tried to do is always be respectful of the people who've asked me questions. I don't frankly think I've always been treated with a great deal of respect, and it's not even a personal thing. If you don't like me, that's one thing, but I am the Attorney General of the United States." News that the IRS targeted conservative groups for intense scrutiny is just one in a series of revelations pointing to a culture of expediency and intolerance in the Obama White House that corrupts this administration. Consider the September slayings of Ambassador Chris Stevens and three other U.S. diplomats in Benghazi. If the attack were revealed to be undertaken by terrorists, it posed a grave embarrassment to the president’s anti-terrorism strategy—eight weeks before the election. Yet, just days later on the Sunday talk shows, UN Ambassador Susan Rice characterized the incident as the result of spontaneous street demonstrations inspired by an anti-Muhammad YouTube video. Obama Care, having passed through the Senate on a slight-of-hand, has been contentious from the start, and the Congress has not appropriated as much funds as Health and Human Services Secretary Kathleen Sebelius would like to implement the law. To do the work of HHS, she has sought large contributions from private health care companies to liberal non-profit groups. With health care so heavily regulated, it is hard to characterize these donations as voluntary. On April 27, Attorney General Eric Holder defended a federal judge's decision to read confessed terrorist Dzhokhar Tsarnaev his Miranda rights after only 16 hours of interrogation, saying: “Everything was done appropriately, and we got good leads.” Holder's statement confirmed earlier reports that he had foreknowledge of, but failed to object to, U.S. Magistrate Judge Marianne B. Bowler’s decision to "mirandize" Tsarnaev. Judge Bowler's sudden appearance at Tsarnaev's hospital bedside prompted alarm from the FBI agents who were questioning him. Holder is correct that the FBI had managed to obtain "good leads"; what he does not acknowledge is the leads they might yet have uncovered. The failure to insist on as full an interrogation as possible fits a pattern of Holder standing up for terrorists' rights despite the danger to American lives. The FALN case was not the only troubling evidence of Holder’s sympathy for terrorists. Holder served as senior partner in the Covington and Burling law firm, which took on the cases of 17 Yemeni terror detainees being held at the Guantánamo Bay prison. Holder also represented Chiquita Brands International in a plea bargain over payments to the AUC, a Columbian terrorist paramilitary organization, as Michelle Malkin noted in 2009. In 2010, Liz Cheney and her Keep America Safe organization pointed out that Holder’s Department of Justice (DOJ) included nine lawyers who had previously represented Al Qaeda terror suspects. Critics charged, falsely, that Cheney was arguing that terrorists did not deserve lawyers. She did not dispute their right to counsel, but did question whether those who volunteered to provide it could be trusted with the nation’s security. Indeed, over and over again, Holder has placed his left-wing political agenda ahead of national security. He insisted on trying 9/11 master plotter Khalid Sheikh Mohammed in federal court in New York City until he was forced to back down under political pressure. Shortly after the 2012 election, Holder seized the opportunity to bring Osama bin Laden’s son-in-law to New York City for a civilian trial, again regardless of the risk. One of Holder’s top priorities at the DOJ was to investigate the CIA for interrogations of terrorists conducted under the administration of President George W. Bush. Ultimately, Holder decided not to bring any charges, but the investigation had reportedly damaged morale at the intelligence agency. Intelligence-gathering from terror detainees has since become a repeated source of trouble, from the Christmas Day bomber in 2009 to Tsarnaev. Holder famously promised that bin Laden would not be read his rights because he would be killed first. As with much of the Obama administration’s policy on terrorism, however, bin Laden has proved to be an exceptional case. Holder has shown enthusiasm for the expansive use of executive powers, such as the use of drones, but has shown less enthusiasm for his fundamental responsibility of enforcing the law and keeping America safe. Marc Thiessen, writing at the Washington Post, notes that Holder suggested in mid-2010 that the rules around Miranda warnings should be reformed to reflect the realities of international terrorism. Such changes were a "top priority," Holder promised. Yet despite Democrats holding control of both houses of Congress, Holder "failed to deliver," Thiessen observes, leaving the U.S. unequipped to deal with Tsarnaev. Celebrated defense lawyer and civil libertarian Alan Dershowitz was calling for Tsarnaev to be mirandized even before Judge Bowler had done so, largely because he believed the public safety risk had passed once both suspects had been neutralized. But others called Holder's move premature, and Rep. Peter King (R-NY), chair of the House Permanent Select Committee on Intelligence went further, calling it "absolutely disgraceful." After the Boston Marathon bombings, President Barack Obama promised: “But make no mistake, we will get to the bottom of this, and we will find out who did this, we'll find out why they did this." The DOJ had advance warning of the judge’s intent and did not dissuade her. At best, Holder’s conduct reflects appalling incompetence and confusion. At worst, it is part of an effort to place the rights of terrorists above the lives of Americans. Paul had threatened to hold up Brennan's confirmation on the floor of the Senate if the administration did not clarify whether targeted drone strikes could be used inside the U.S. In his letter, Holder called the question of drone strikes inside the U.S. "entirely hypothetical, unlikely to occur and we hope no president will ever have to confront. … As a policy matter, moreover, we reject the use of military force where well-established law enforcement authorities in this country provide the best means for incapacitating a terrorist threat." "It is possible, I suppose, to imagine an extraordinary circumstance in which it would be necessary and appropriate under the Constitution and applicable laws of the United States for the president to authorize the military to use lethal force within the territory of the United States. For example, the president could conceivably have no choice but to authorize the military to use such force if necessary to protect the homeland in the circumstances of a catastrophic attack like the ones suffered on Dec. 7, 1941 and Sept. 11, 2001."